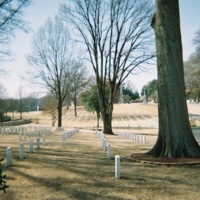 A photo of the Salisbury National Cemetery it focuses on the thousands of graves along with the Maine and Federal Monuments. It was a beautiful day for taking pictures. Nathan Johnson, Salisbury Monuments, Civil War Era NC, accessed April 24, 2019, https://cwnc.omeka.chass.ncsu.edu/items/show/874.